This is a great anchor activity to assign to individual students. It allows them to engage in meaningful work while you’re involved with other students in a small group. 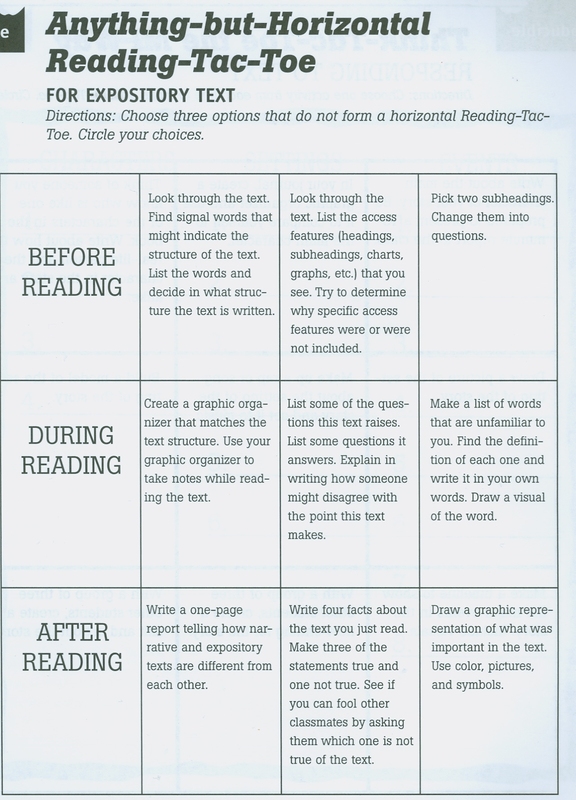 Give each student a copy of the “Anything-But-Horizontal Reading-Tac-Toe for Expository Text” worksheet. Each student should choose one assignment from each COLUMN in order to form a Think-Tac-Toe. One of the assignments in the first row should be completed Before Reading, one from the second row During Reading, and one from the last row After Reading. Specify how long students have to finish these assignments while reading/working with the text that has been assigned.